IMAGE: IMAGE: Tanu Shree Pareek is an assistant commandant in the Border Security Force. Her responsibility is to guard the Punjab border which is prone to drug trafficking. The only woman among 68 men, Tanu Shree Pareek had failed the Tarzan rope routine four times. She slipped on each attempt, while all the male trainees completed it successfully. Her leg was injured. Her morale was in her boots. 'Want to take a last try?' asked the instructor. 'Yes,' she said, pulling herself together. "I told myself -- 'Not this time, Tanu yaar. Not this time. You bloody die, but die ahead of that line'," she says over the phone while travelling from her post on the Punjab border to a firing range. "I thought like them I have two legs and hands. If they can do it, why not me? I will not fall this time." 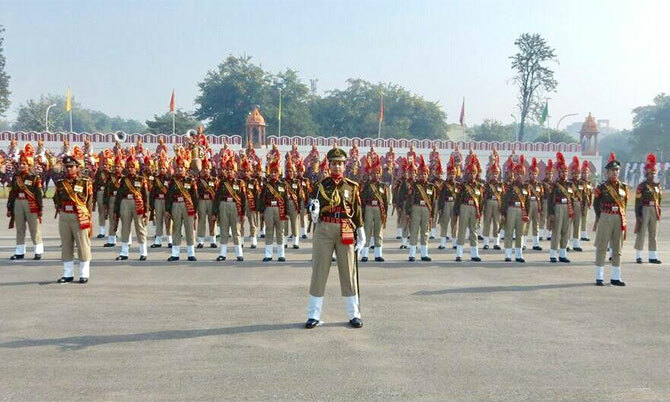 At the end of the year-long training, Tanu Shree Pareek led the 68 men at the passing out parade in Gwalior. Never had a woman commanded an all male own rank parade in the paramilitary before. She was adjudged the second best trainee officer of the batch and on that hot summer day in 2016, she became the first woman officer in the Border Security Force's 51-year history. The BSF, the world's largest border force, started inducting women constables in 2009, but Pareek is the first woman assistant commandant. 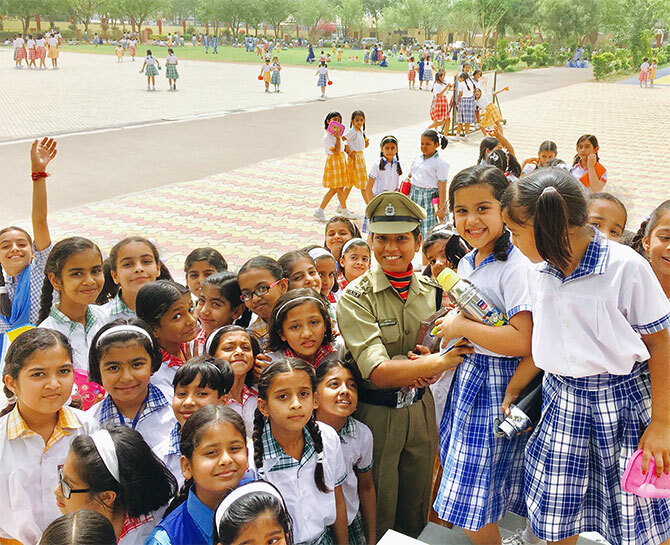 "BSF officers are known by their course number, Singh adds, "but because of her, our batch also has another identity -- as 'the batch that had Tanu Shree Pareek'." Deployed on the Punjab border prone to drug smuggling from Pakistan, Tanu Shree commands 136 men under her area of responsibility. The senior-most trooper in her BSF battalion is 57 years old. Tanu Shree is 26. It was the first time that men were taking orders from a woman officer in the company. To many she was younger than their own daughters. To some beset with a patriarchal mindset with years of service in the BSF, it was uncomfortable being commanded by a young woman fresh into service. It took some getting used to. She was addressed as 'Sahib', 'Sir' or 'Madam'. "I respected their intention and said fine let them call me whatever they want," she says. "Ultimately, you are treated according to the stars on your shoulder. Not as a man, not as a woman, not as a girl." 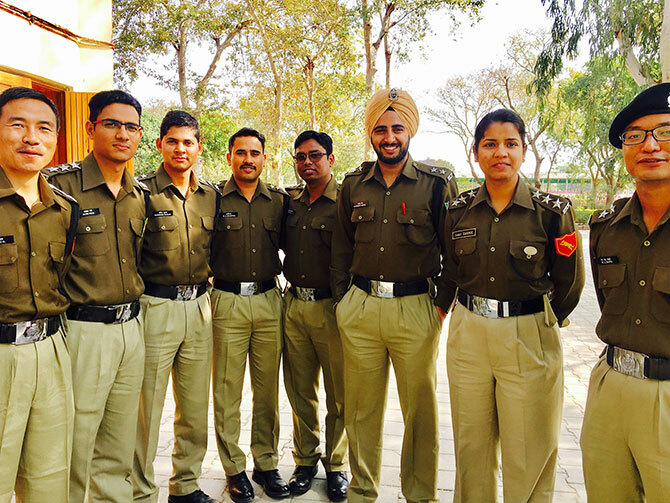 IMAGE: Tanu Shree with her BSF batch-mates. Since she joined the BSF last year, the Bikaner native has been awarded three commendation medals by the BSF's director general. "Being the first lady BSF officer I owe a responsibility -- whatever I do, I try to do with excellence," says Tanu Shree. "If firing practice is to commence at 4.30 am, I will be there at 3.30. I don't want to be a victim of the generalisation that is always faced by women." En route to a firing range that day, she points out that this conversation is only possible because she is travelling away from the border towards habitation. The closest village near the BSF camp is a few kilometers away, but at the border there is often no cell phone connectivity. "Most important is professional soundness. The men reciprocate based on your actions. If someone is not firing correctly, you show them how it is done. You have to set an example," she explains. What her preferred weapon, I ask? "I like the X 95, but the fire of AK (the AK 47) is marvelous -- no competition to that weapon." 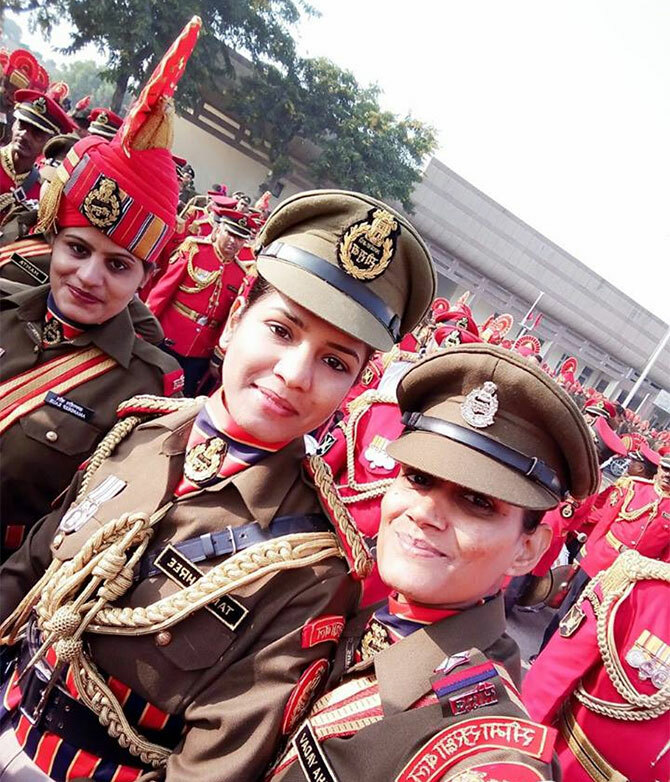 Right from her days as an NCC cadet, Tanu Shree says she always found that the uniform helped her stretch her limit -- literally and figuratively. "In the corporate world you have to worry about your sari or dress not being crumpled, here you don't have such issues," she says as she gives me a run down of what life at the border is like. The assistant commandant's day never really begins with actually getting up in the morning because between 3 am and 5 am is the most sensitive time on the border. "If something happens on the border your night is work time," she says. "When I was in college I used to sleep at 3 and wake up at 9.30, now if I stay in bed till 6.30, I feel worthless -- like being in a graveyard. IMAGE: Tanu Shree, centre, commands a company of 136 BSF troopers on the Punjab border with Pakistan. The biggest problem in her area of responsibility is the smuggling of drugs from Pakistan. The narcotics make their way into Punjab and are quickly transported to other parts of the country. The Indian border is fenced but in certain places in Punjab, crop fields lie ahead of the fencing and stretch up to the international boundary. At her BSF camp, the gate is opened every morning for farmers to go and cultivate their fields. The farmers have an identity card issued by the BSF. Each and every person, tractor and trolley -- including food and utensils -- is thoroughly frisked. Life at the border for her, she says, is no different than it is for a male assistant commandant. "There is no war time or peace time for BSF. The army, navy, air force personnel have peace time postings, but we are always deployed on the frontline -- Kashmir, Gujarat, the Sundarbans or Punjab -- every place has its own peculiarity and problems." Last month, Tanu Shree met her batch mates at a reunion where the group shared experiences about their first year. Only in the Punjab and south Bengal are BSF camps close to habitation -- in Rajasthan, Gujarat, the north east -- one cannot spot humans for 200 to 300 km. IMAGE: Last year, Tanu Shree visited over 100 schools and spoke to children, especially girls. The past two years have been a great learning and she has not had time for anything else beyond work. 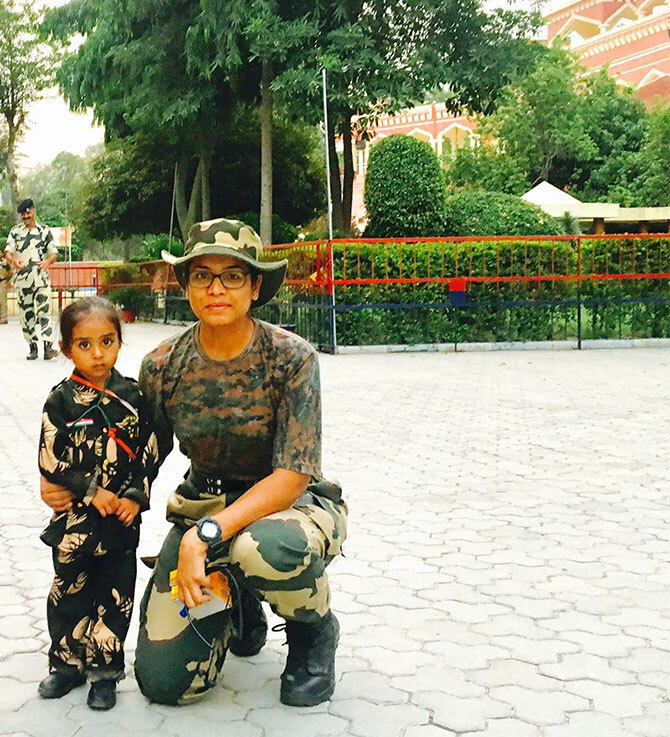 She last met her parents when they had come to see her lead the BSF's Raising Day parade. Her younger sister recently left home to pursue an MBBS degree. 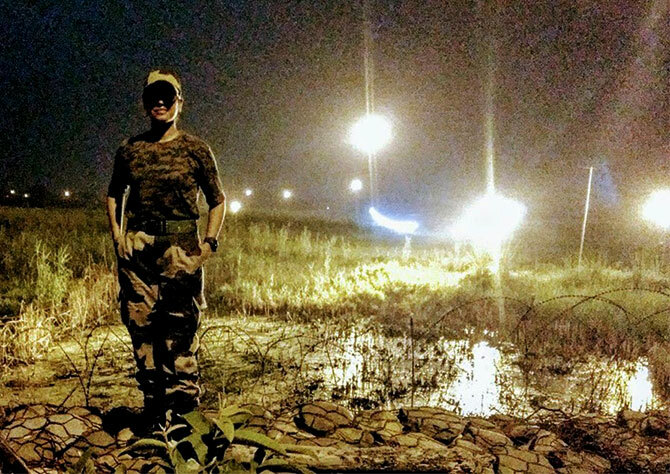 Looking back at her first year as a BSF officer, she says one of the high points of her field training was a 50 day camel safari with women officers of the Indian Air Force through the border states of Rajasthan, Gujarat and Punjab. The 20 women went to over 100 schools, mostly run by the government, to speak to girls. The expedition began on Independence Day and ended on Gandhi Jayanti at the Wagah border which is guarded by the BSF. In the interiors, she realised it was important to include men in conversations about gender equality because in rural households, they remained the controlling authority. "Women have seen that boys have all the freedom and want to have a male child. Many a times it is the mother and grandmother who perpetuate patriarchy and this dogma needs to be dispelled." Celebrated as a role model wherever she goes, people often ask what her message to young people is. "I say my message is not for the children, but to parents -- treat them as children, not as boys or girls." Meet the woman who slept with 5000 men!